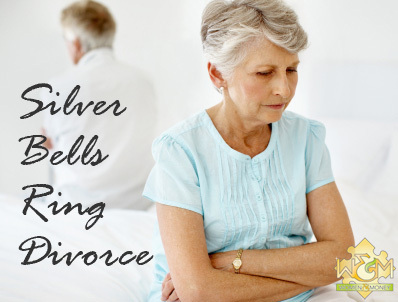 Silver Bells Ring Divorce - Women and Money Inc.
With a sad heart I read an article in the Vancouver Sun recently about seniors divorcing. According to Statistics Canada, the phenomenon of “grey divorce” — or separation in one’s silver years — has been steadily increasing – up almost three per cent from 2006 to 2008. Once again the finger is pointed at the baby boomer generation. It’s one thing to watch marriage disintegrate before our eyes with younger people. Generation X, Y and Z are products of the information age where business and social institutions have experienced radical change if not extinction since the 1980s. Look at the debt crisis as one example. So many have lost touch with values that promote families and child-rearing, patience and a healthy fear of debt – values that came from the generation that gave birth to the baby boomers. One opinion suggests that the 1960s did all the damage. It was drugs and rock n roll. But this caricature smells too much like marijuana smoke to me. The baby boomers successfully challenged the very essence of racial prejudice, inequality and social injustice in North America. They or we, depending on your age, set the stage for a made in Canada social order that enshrined human rights into our constitution, the legal framework for social justice. How could such profound thinking result in the destruction of the nuclear family unit? The great shift in values in the 1960s got lost in a new economic system of promissory notes and credit cards that soon required both spouses to get jobs to meet a new wave of escalating household expenses that quickly became dependent upon credit for survival. This happened in the 1970s and 1980s. This was very different from my grandparents and the generations that lived before credit cards and automated banking. Suddenly children were shuttled to daycare centres and babysitters while both parents scrambled to make ends meet. As technology broke down so many of the barriers of the past to information, business and commerce everything got busier and faster. Everything had to be instant. We had to have instant possession of a new car or an in-house television theatre system. We wanted quick and easy solutions to health issues like a pill to cure depression. We demanded instant solutions to marriage problems like divorce – get rid of the past and jump into a clean slate for the future in an instant. Unfortunately, these new cultural “mores” of the era of credit turned out to be painfully false. The deficiencies of the instant gratification culture finally became obvious with the credit crunch in the United States in 2007-08 and the subsequent debt crisis that continually exposes the weaknesses of societies that are dependent upon credit. It should not come as a surprise that baby boomers are deep in debt by the time retirement arrives. Oh by the way, Freedom 55 was another pivotal financial principle of the Instant Gratification Culture – one that took 30 or 40 years to crumble and vanish in an instant, too. Seniors as a result need help not only with their finances and their debt problems, but also their marriages and divorces. This raises the question of where seniors can get neutral and affordable professional advice about their finances.